I am excited to show you a couple new products I just added to my shop. I hope you don’t mind. I made these stylish shopping totes, which are a little more girly and a little less patchwork-y that my other products. 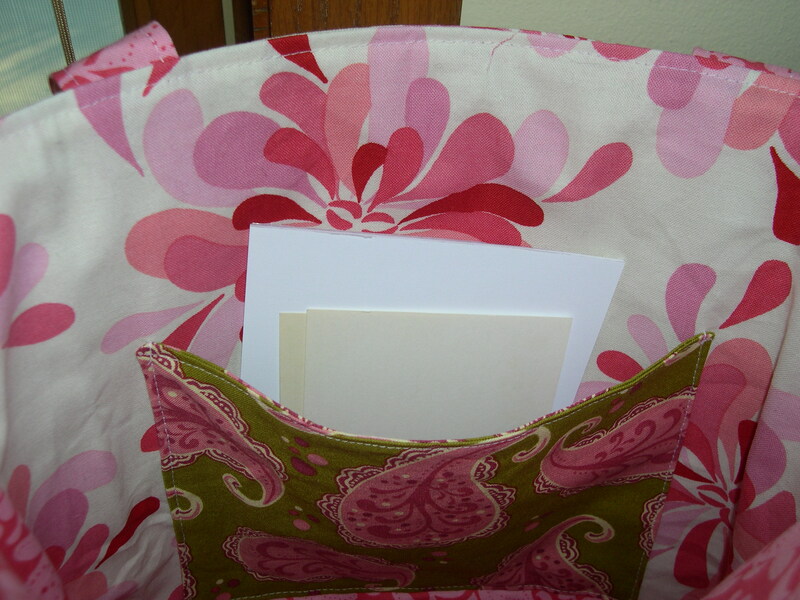 You may notice more of my non-quilt sewing projects are headed in that direction this year. I made them using fabrics from Sandi Henderson’s Farmers Market collection. I always thought that line was so whimsical and charmy and cheerful! 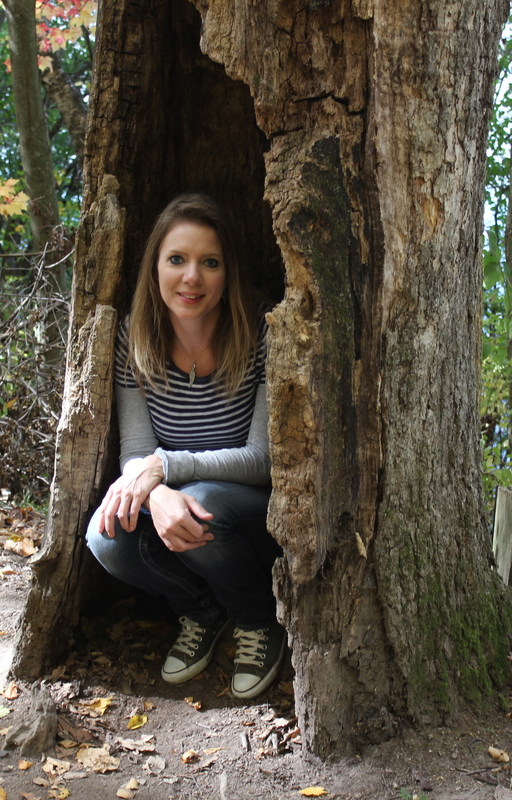 They have flat bottoms, making them sturdy enough to carry heavier items, like books or a laptop or produce from the grocery store. They measure 13 inches wide by 14 inches tall, and they are lined with heavy fusible interfacing to make them more sturdy. They have an inside pocket big enough to hold coupons or recipe cards for shopping or a charger cord if you’re carrying your laptop. 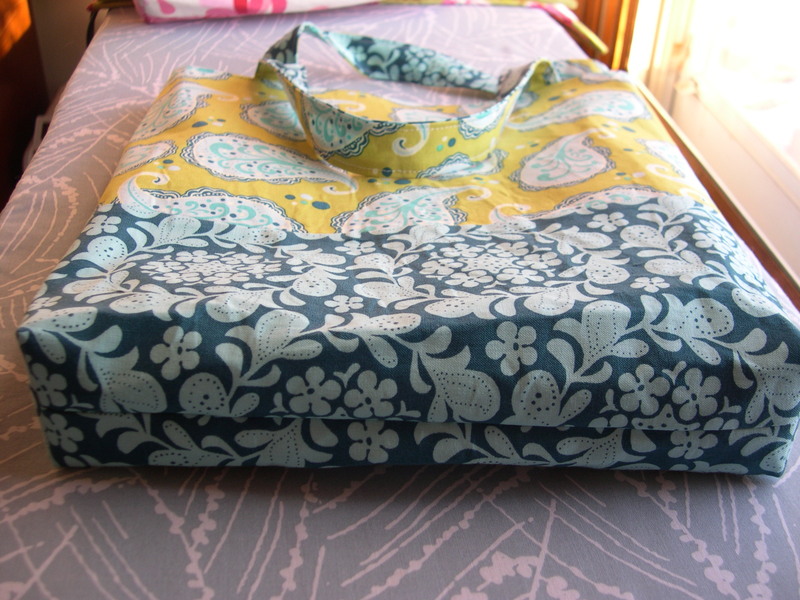 I made another shopping tote to add to the mix, with fabrics from Tanya Whelan’s Ava Rose collection. What a wonderfully girly collection that was! 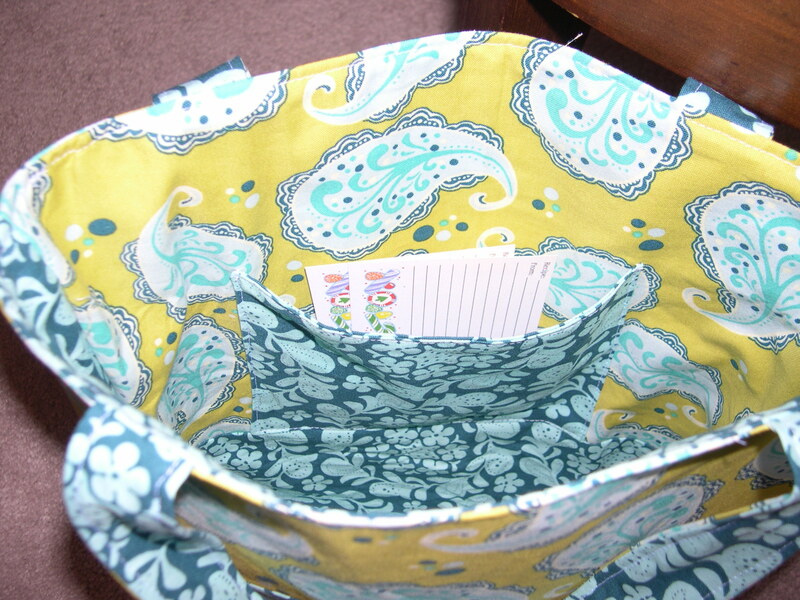 This shopping tote isn’t lined with any interfacing, so it can be folded up and tucked into your purse for spontaneous shopping. 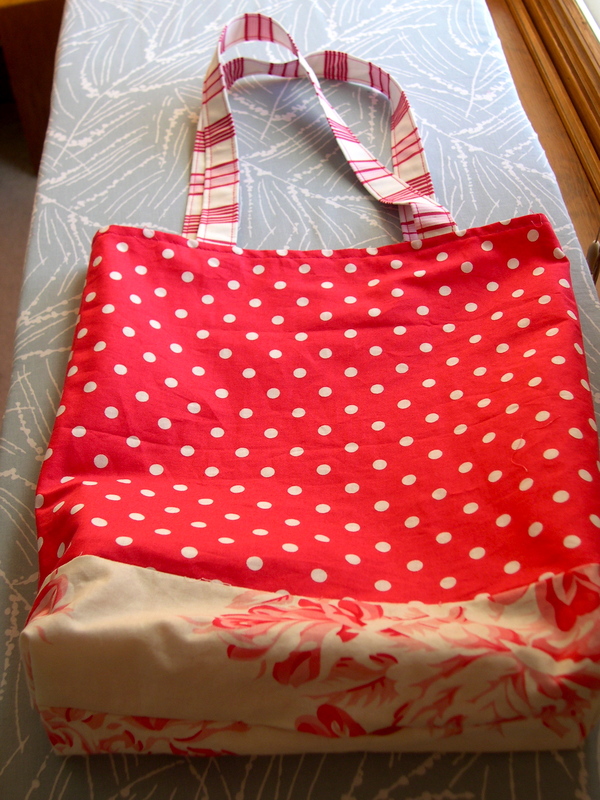 The outside is a rose fabric with polka dots on the bottom. But wait, turn it inside out, and you get a polka dot bag with a rosey bottom. 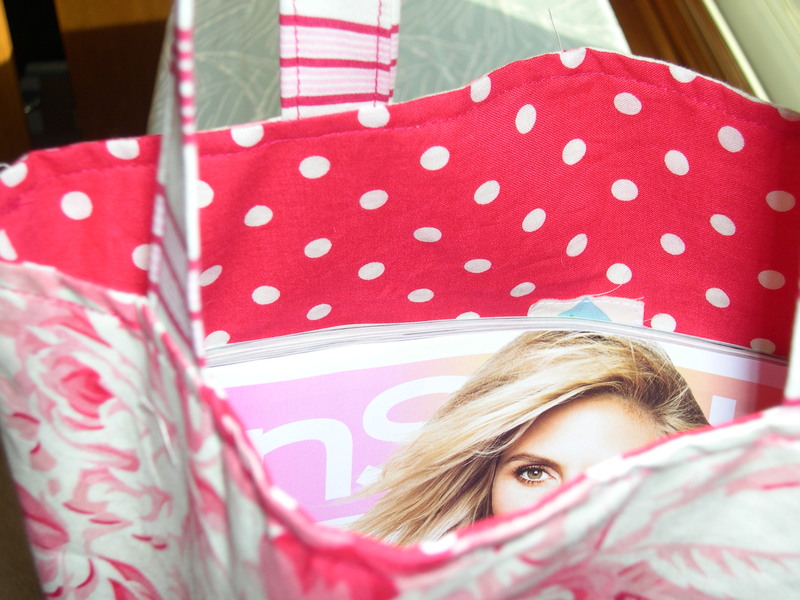 It measures the same size as the totes above – big enough to fit a magazine or some goodies you pick up at the craft supply store. I only made one in each color, so get ’em while they’re hot! Tell all your friends, especially the non-sewing ones. I like the size and the flat bottoms. 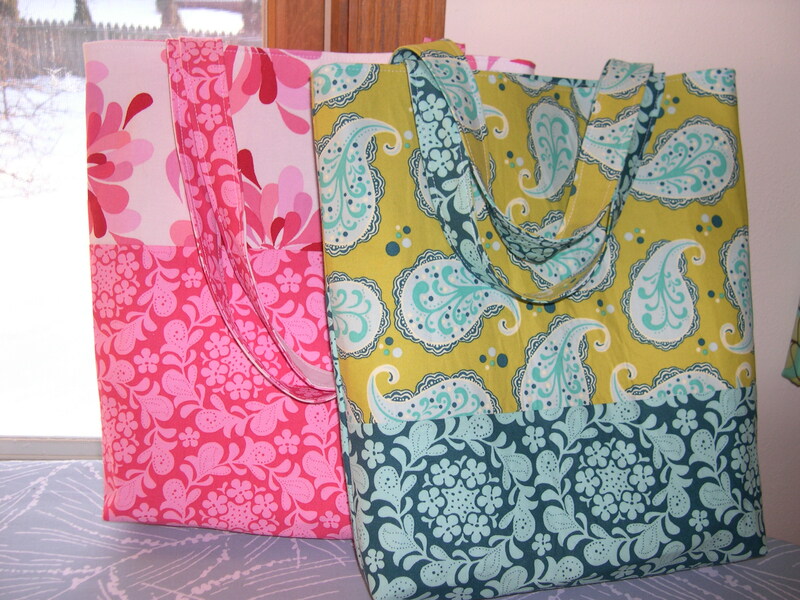 My favorite is the reversible tote. These are so cute! I’m sure they’ll go fast. . .you may have to stitch up some more. Love them all…but the polka dot one…wonderful!!! Lovely:) I totally heart the yellow one. wow, those are incredibly cute! Nice design! My favorite is the one in cool tones. very, very pretty! I love them, such bright and springy colors! adorable! I really like your fabric choices. Pretty and practical!! 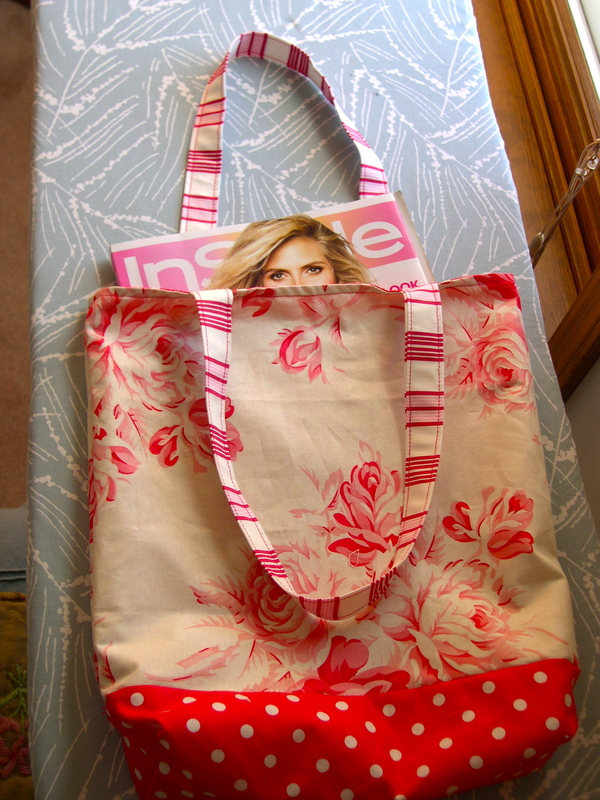 I especially love the darla tote with the red polka dots – irresistible! You always choose the best fabric combinations. Terri! Those are beautiful!! 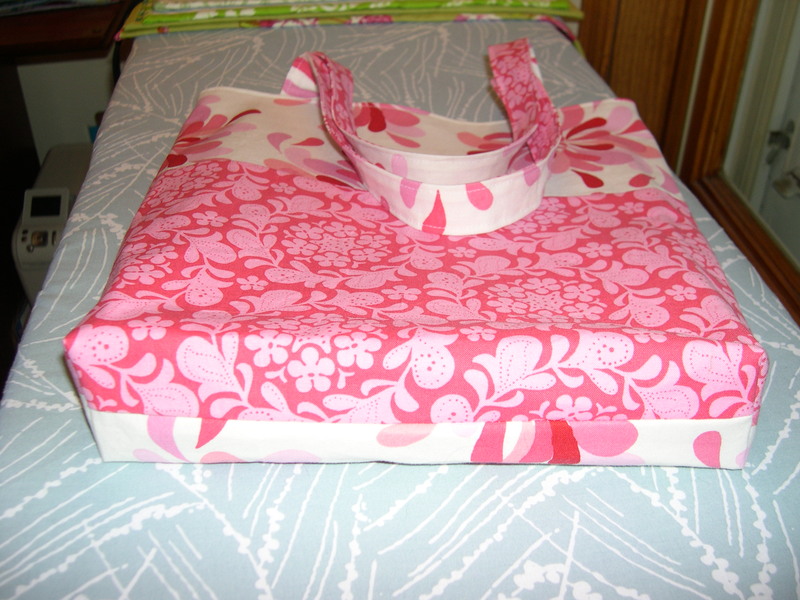 Love those Sandi Henderson fabrics and the red polka dot fabric is so fun. Great job on the totes, I bet they won’t last long. You’ve been very productive.